You are probably wondering why the roof you put on less than fifteen (15) years ago is now failing. You thought you purchased the best product and the sales person told you to buy the 40 year heavy architectural shingle, and you will never have to worry about your roof again. So what happened? Why is your roof failing? Did you miss the warnings of your failing roof? So what happens to a failing asphalt roof? 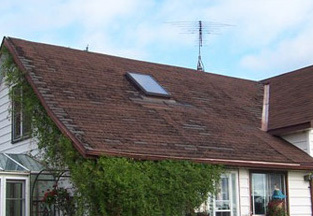 Asphalt shingles are dried out by heat and ultraviolet sun rays. Eventually the loss of the heavy oils causes the fibres to shrink, exposing the nail heads under the shingle flaps. The shrinkage also breaks up the surface coating of sand granules adhered to underlying asphalt-coated paper. Without the protection of the embedded granules, the paper begins to tear itself apart and so begins your failing roof. Once the nail heads are exposed, water running down the roof can seep into the building around the nail shank, resulting in rotting of roof building materials which also causes moisture damage to your ceilings and interior paint. While the asphalt industry has its problems the metal roof industry continues to grow in market share. This growth has been fuelled in part by the short comings of asphalt roofs. But the beauty and maintenance-free aspects home-owners get by installing a metal roof is the larger reason for the industry’s growth. If you are interested in getting a new roof, allow us the opportunity to quote for a more permanent solution which will save you thousands of dollars in the long run. You can call us at 1-800-901-6884 or you can fill out our on-line request form located at the top right hand side of this page.